Au is hungry about every 30 minutes at the moment. He knows exactly what's in the fridge and is determined to have his full share of treats. Here he is, supervising Tom deboning some chicken for him. As you can see, Au sits on the table but doesn't beg, steal or touch the food. He's simply being very, very patient in a vaguely supervisory capacity! There is no Katz Tales or Dog Talk out in The Star this Saturday, but you may see my article on Urban Mushing: dogs who take their people out and about on tricycles etc. It's great fun! For more see Jojo's Sohum Mushers and Mark Schuette’s web site. 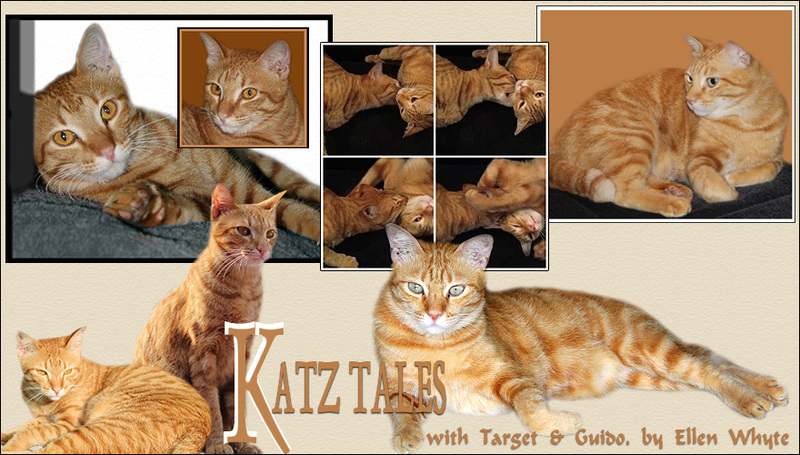 For more cats, check out Gattina's page or check out the Cats On Tuesday blog roll in the margin. He is being very good. We are never that good. What a well behaved cat...but he knows very well its HIS food, right! He trains his master well...hahaha! What a good boy Au is! Who could resist that dignified, handsome little face? Au and Target have trained you and Tom very well! P/S: Any news on Sweetheart? What a well behaved cat, but I never steal food. Mum can leave it out on the work surface and I would not touch. We are good ginger cats lol. Thank you so much for visiting me I love vsitors. Au is a good boy very well educated, very polit and patient! He should come at home to give some lessons to my french family cats!!! Ik ben zielig want ik sta nog steeds op dieet !! Er gaat alleen erg langzaam iets vanaf of zeg maar heel eerlijk, er gaat op t moment niets vanaf hihi..
Ah, he is so very patient! Our boys don't have that kind of patience, lol! Wow, he is very well behaved. He probably has confidence that the food will come to him, so no need to beg. Luna is the same way, so she doesn't beg, and is very picky about her options. What a good cat ! Arthur would have eaten the thumb already instead of the chicken, lol ! Good kitty! Now, we have dogs .. as a girl I had cats and one of my favorite kitties name was 'bend and stretch' because I had her do her exercises in the morning. Au, you're such a good and patient kitty!! Wow! Thats very impressive. The Spice Cats are not allowed on the Kitchen tops so I do not have that problem. And the dogs, I make sure I am done preparing for the food and give them the OK sign before they can eat. You've gotta teach the humans. You seem like a true master! He may look patient, but nothing can hide that glazed look in his eyes. The power of chicken!!! The human is doing a very nice job deboning chicken! Yummy Chicken! Cats can be obedient and submissive like any humans. I believe it's up to us. They also respond the way we treat them. It's lovely to have them around when they are all like your Au. Here's my cat blog. Sorry for the inconvenience. I am sorry but I really have difficulties with loading your page. Yesterday for COT it didn't work ! and impoosible to make the comment on the right post ! Pookie too loves scratches all over her head ! Just like Au ! thanks.. unfortunately, my nie nie sick already. i bring her to vet yesterday. hope she'll recover soon.